Once you’ve been cooking a while, you realize that, although spices don’t have expiration dates, there’s probably a time to let them go. Some people say that the limit is one year, but I think they’re taking kickbacks from the spice companies. This entry was posted in Art, drawing, Humor and tagged cartoon, comic, cooking, Drawing, funny, Humor, old, spice, spices. Bookmark the permalink. 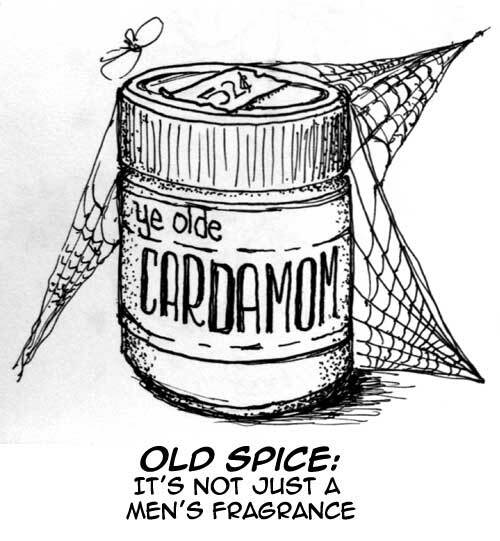 I realized when I was trying to think of a spice to draw for that cartoon that I have no idea how to use cardamom. There are other mysterious spices in my spice rack. They come out for recipes, but I never spontaneously pull them to add seasonings on my own. Cardamom is one of my favorites. If a recipe calls for nutmeg, I’ll usually put a pinch of cardamom in too. In fact, I put a bit in the carrot cake I made over the weekend. It’s also usually in chai tea recipes. I’ll be sharing one here soon.